“American Idol’s” second season runner-up Clay Aiken has his own idea of what the show should do to replace departing judge Simon Cowell. Aiken, however, has plenty of singing to do before having that discussion. The North Carolina-based singer released his fifth album, “Tried & True,” on June 1; the collection of pop standards — including “Unchained Melody,” “Can’t Take My Eyes Off You,” “Misty,” “Mack The Knife” and “Moon River” (with Vince Gill) — marks his first release away from the “American Idol” enclave of 19 Recordings and Sony Music (he’s now with Decca), and Aiken feels it shows the measure of the man better than his previous releases. Besides the album, Aiken performed a special concert in March at the Raleigh Memorial Auditorium which was taped for a PBS special that will air in August, along with an accompanying DVD. 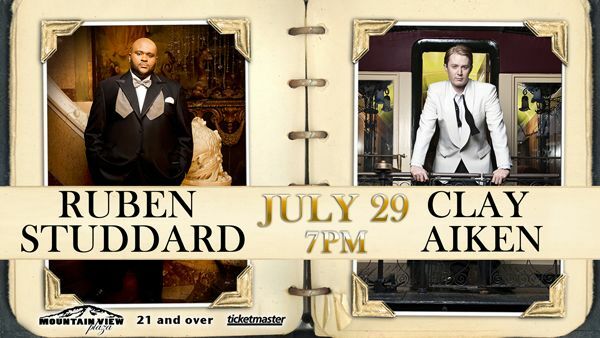 Meanwhile, Aiken is gearing up for the July 23 start of his 16-date summer tour with second-season “Idol” winner Ruben Studdard, who was one of the guests at the March concert. Another one of my favorite tours! Both of them were hilarious and you can SEE what good friends they still are since they sang together on Season 2 of AI. I was fortunate to see the last show of this tour in Biloxi, MS. It was fun to DRIVE and not fly for a change. Still hasn't been to Louisiana, but it sure was close enough! GREAT opening show in LA! That was great reading the "Billboard" article again. Clay would make a great judge. What is wrong with AI???? Clay was a teacher….perfect choice!!!!!!!! Seems they can't see the forest for the trees. Loved the "Timeless Tour" as well with Ruben. Seems everyone now a days is touring together. Who knows what will happen next??? I did love how they did the show together, unlike Clay and Kelly, where each did 1 hour to themselves. I was bored with Kelly (at that time), and could only had eyes and ears for Clay. (STILL DO…BY THE WAY!!!) I miss Clay!!!!!! What fun to watch this clip again. That was a great tour with Clay and Ruben. Reading the article again, shows that Clay knows what he is talking about as far as AI and music. Someone should listen! Error: Error validating access token: Session has expired on Tuesday, 21-Aug-18 16:13:01 PDT. The current time is Thursday, 25-Apr-19 18:04:58 PDT.